Photo courtesy of David Grimaldi, PhD. And now, scientists have discovered something trapped inside they’ve never seen before… feathers. Imagine the forests of Burma in the Mid-Cretaceous, the last great age of the dinosaurs. Oppressive heat and air thick with carbon dioxide. Ants with giant pincers, the distant roar of a carnivore doing battle with its next victim. Cycads, ferns, conifers and vegetation as far as the eye can see, with flowers adding a new palette of color to the endless green. In this forest, damaged trees ooze a thick resin, trapping insects and small animals, seeds, leaves and other organic material. Flash forward to 2016, and that resin has fossilized into an exquisite hard polymer, and the stuff trapped inside has barely changed. In a sense, through the glowing yellow lens of polished amber, we’re not just looking at a bug; we’re looking back in time. And now, scientists have discovered something trapped inside they’ve never seen before… feathers. 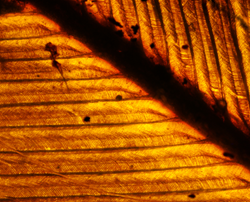 At the Houston Museum of Natural Science, the finest collection of Burmese amber on Earth joins the Morian Hall of Paleontology Feb. 19 in a special exhibition titled Amber Secrets: Feathers from the Age of Dinosaurs. Peer inside more than 100 gorgeous specimens and discover for yourself the contemporary breakthroughs that have paleontologists re-thinking the history of life on Earth. Assembled by Dr. David Grimaldi, Curator of Invertebrate Zoology at the American Museum of Natural History, the exhibit emphasizes the beauty of these fascinating fossils and place them into scientific context. Inside these golden tombs is evidence that feathered creatures existed in the fossil record much earlier than imagined — as far back as 99 million years ago! But they tell other stories, as well. The faithful preservations of plants, fungi and invertebrates like insects, arachnids, snails, millipedes and centipedes provide crucial information that could account for the rise of flowering plants. Paleontologists have puzzled over the connection between dinosaurs and birds for decades, but just as confounding is the exact era in which plant life began to develop flowers, which ultimately links plants to pollinators. Sugary nectar and bright colors attract insects, and nailing down the specific era when pollinating insects like beetles arose could pinpoint the arrival of angiosperms. So far, paleontologists know this: at the beginning of the Cretaceous, about 145 million years ago, the landscape was entirely green, and by the end, about 66 million years ago, the forests were full of color. The answer is in the broad period between these two dates in deep time. Because arthropod exoskeletons are too delicate to fossilize alongside the bones of large vertebrates like dinosaurs, the search for bug information has proven extremely difficult. Fossilized plants and insects are hard to find unless they are trapped in amber. Bask in the glow of these beautiful fossils, and feel the excitement of discovery in Amber Secrets: Feathers from the Age of Dinosaurs, opening Feb. 19 through March 26, 2017. Prior to the grand opening, drop by the Wortham Giant Screen Theatre Wednesday, Feb. 17 at 6:30 p.m. for Amber, Nature’s Time Capsule, a Distinguished Lecture by Dr. Grimaldi introducing the exhibit. In addition to his curatorship at the AMNH, Grimaldi is a professor at Gilder Graduate School and Adjunct Professor of Ecology and Evolutionary Biology at Columbia University and CUNY, and Adjunct Professor of Entomology at Cornell University. During the first month of its opening, check out more special events including Amber Workshop with HMNS Associate Curator of Paleontology David Temple Tuesday, March 1 at 6 p.m. (tickets $45, members $35) and a behind-the-scenes tour of the exhibit Monday, March 7 at 6 p.m. (tickets $27, members $17). For tickets or more information, visit http://www.hmns.org or call (713) 639-4629.